This Tuesday evening, from 5:30 to 8 pm, Scenic Hudson, Riverkeeper, Green Beacon Coalition, and the City of Beacon will convene for a public meeting, aka a "Night of Action," at Scenic Hudson's River Center at Long Dock Park in Beacon to discuss the findings from the Environmental Protection Agency (EPA) of whether General Electric (GE) completed its cleanup of decades-long releasing of toxic chemicals into the Hudson River. The EPA produced a draft Five-Year Review. 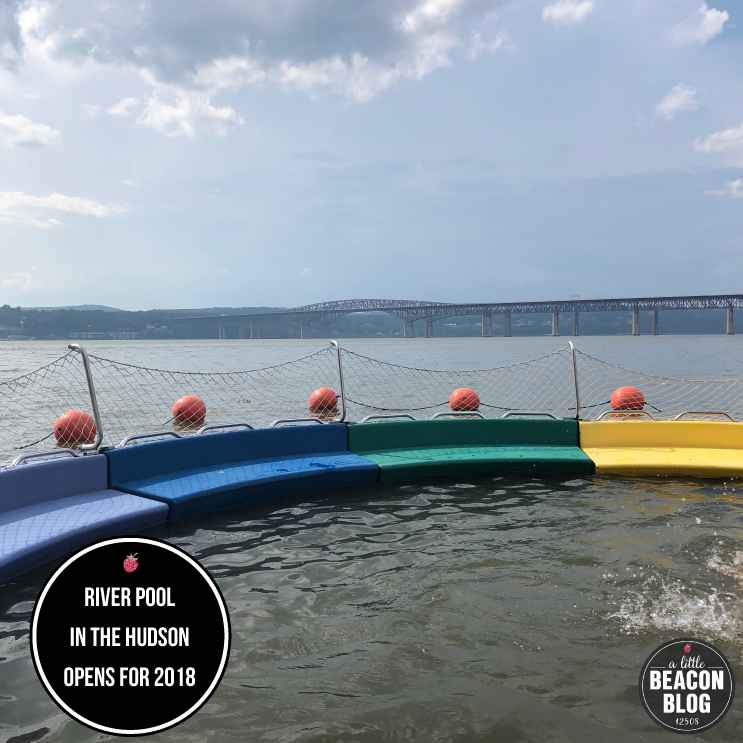 According to Scenic Hudson: "The draft Five-Year Review outlines the goals of the cleanup and whether or not these goals have been met and if the remedy is functioning as intended. EPA is stating that the project 'will be protective' of human health and the environment in 53 years, but state and federal agencies are saying a century or more." During the event, Scenic Hudson will show a presentation that will walk through the Five-Year Review and its findings. The groups are hoping that the presentation will help provide the audience with talking points to spread via word-of-mouth. They also will collect public comments that will be submitted to the EPA by the September 1 deadline, calling on the EPA to change their determination and require additional cleanup from GE. The event will also include a screening of a new clip from filmmaker Jon Bowermaster, a Q + A discussion, and a comment-writing opportunity for guests to fill out postcards that will be mailed to the EPA. For more information, visit scenichudson.org or RSVP on Facebook. 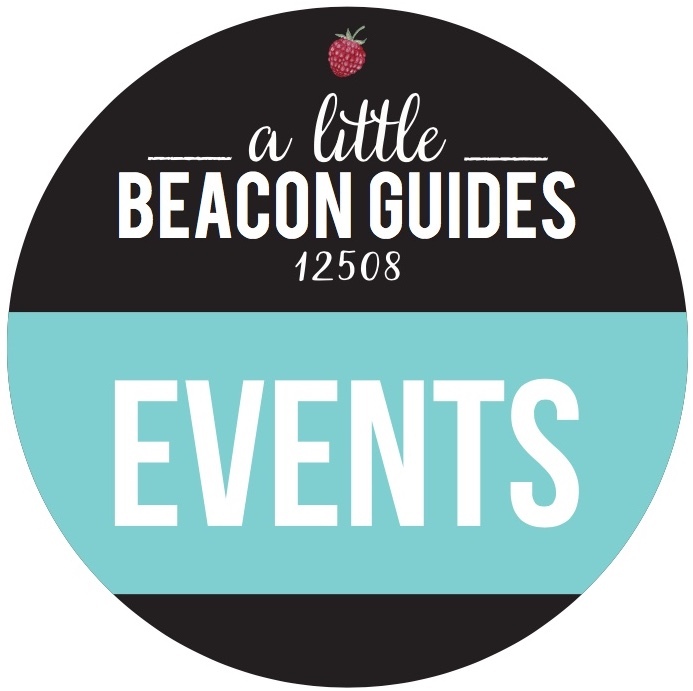 Beacon Open Studios (BOS) is a signature, citywide event in Beacon. For some, including myself and this year's new director, Samantha Palmeri, the discovery of this citywide art show happened quite by accident while meandering outside. Every year, dozens of Beacon artists clean up their studios, organize their brushes, and put out their best tools and works of art. Through this project, the public is invited in to directly access artists and their productions. Beacon Open Studios is going on now, on May 13 and 14 from noon to 6 pm. The kickoff party was Friday evening at Oak Vino. Open studios are identified by a large red dot in the yard of the artist's home studio, or on the studio door of an artist's space in a building. There is an official map that you should pick up or visit on the BOS website, but there is something quite special about stumbling upon a red dot and following your curiosity inside. This wonderment continues to be my favorite way to experience Open Studios. However, the more one learns about each artist, the longer the list of which artists to visit. Some participants are longtime artists who dropped "practicing artist" for a few years and are returning anew, while others are artists who make commissions for private clients or advertising agencies, while others still are artists who produce fantastic work yet only display during times like these. 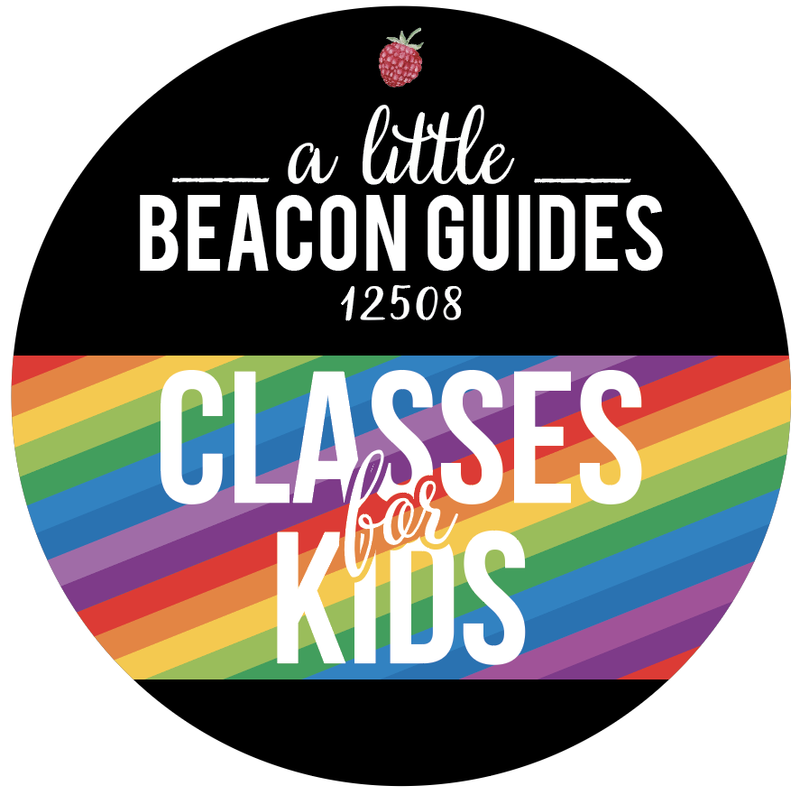 Who Is Participating In Beacon Open Studios This Year? Over 50 artists are taking part this year. Several of them are emerging artists and some are simply to to the event. The physical map, which you can pick up at Hudson Beach Glass or at many restaurants or shops, is organized by artist, but also groups artists by location. For instance, if there are six artists showing in one location, you can search by geography as well, if you wanted to see a bunch at once. Artist: Chris Sanders, "Treasures of the Hudson Highlands"
"Treasures of the Hudson Highlands"
Chris Sanders is a storyboard artist for the film and television industry. Pirate lore of the Hudson River and Valley captivated her, and she began creating graphic novels inspired by pirates who did travel up and down the Hudson River years ago, in search of treasure, or hiding their own. Her first book, a historical fantasy, was published in November. You can meet the artist and see the original pages during Beacon Open Studios. The best part? She's full of Hudson Highlands pirate knowledge, so best ye get thee there. Stan Lindwasser is new to Beacon, but not to the art scene. Stan has been a professional painter for decades, and has designed installations that were shown at the Brooklyn Museum and the Brooklyn Public Library in Brooklyn, NY, and the Bertha Urdang Gallery in New York City. An excerpt from his artist statement includes: "I question the place and role of color: on lines, as lines, or replacing lines. The works I have been doing reflect my careerlong interest in the details of line and color, the creation of shapes and the placement of these on paper, or in space. These paintings reflect my thinking about direction and how changes in density of paint or use of water define and subtly change the composition." 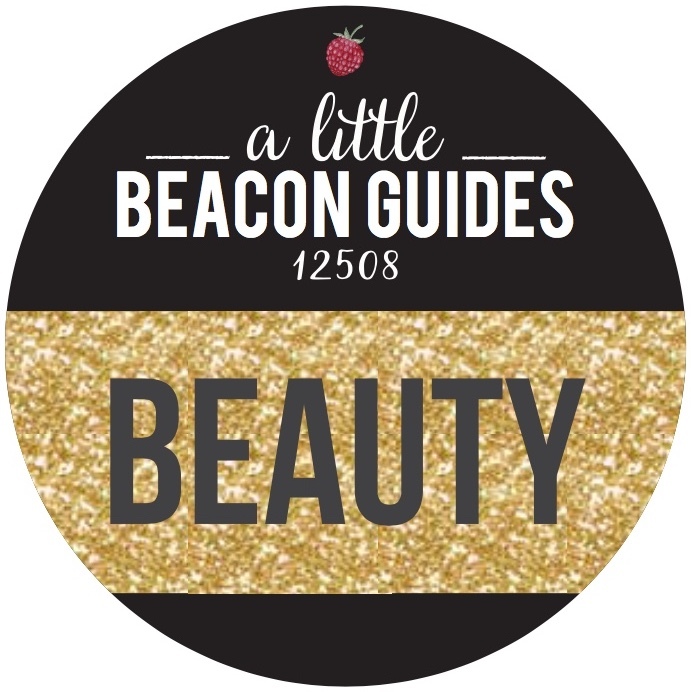 Full disclosure, the design services extension of A Little Beacon Blog works with Stan on his website, so we are familiar with several years of his work, and appreciate his fascination with color. 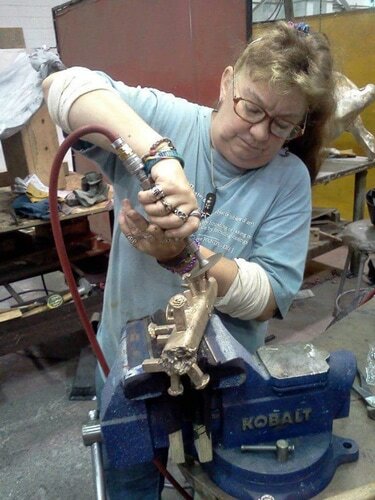 Rosemary makes "jewelry and sculpture from a different perspective," as she puts it. She's opened up her studio for visitors to see how she does it all. I'm from Staten Island originally. I've lived in Beacon 2 1/2 years now. This will be my third year as a participating artist in BOS. I graduated from the School of Visual Arts with a major in painting, and since graduating I've held practically every job in the art world, including teaching, directing, curating, art handling etc. I've owned and directed two separate art galleries, one in Staten Island and one in New Jersey. And I've been a practicing artist for the last 20 years. Why did the directorship appeal to you? Open Studios' Director Samantha Palmeri's artwork, on display at 11 Creek Road. When I moved to Beacon I was very content to just be in my studio working. We moved here because we liked that there was already an art community happening. 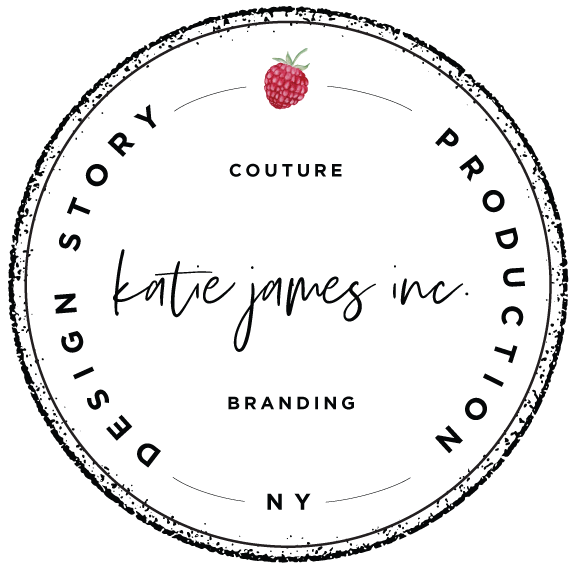 I wanted to join something that was already established and not have to start from scratch. When I heard that BOS was in need of a director and it might not happen this year, I didn't even hesitate to find out how I could volunteer. First of all, it's one of my favorite events of the year in Beacon, plus it was good timing for me, and again, it was already an established community event that had its own footprint and identity. I felt especially as a participant myself I had enough ideas and experience to be able to add to what was already a great event. What was your favorite thing about Beacon Open Studios the first time you experienced it? There are a lot of artists in Beacon! There's a lot to see and experience. The overall quality and diversity of the artwork is great, and it's special to this town because a lot of events like this [in other locales] tend to all look the same with the majority of artists all making similar looking things. The first BOS I went to was before I lived here. We had sold our house and were coming up here expecting to get confirmation on a place to rent. That place fell through and we were wandering around BOS a little depressed because we didn't know if we could find a place to live. We happened to start up a conversation with one of the participating artists and she said, "Oh, I know another artist in town who has a place for rent." We ended up calling her that day and finding the house we rented for the next 2 years. So, I suppose BOS will always be extra-special to me and my family because of that! It just was a perfect example of how welcoming and awesome this art community really is! 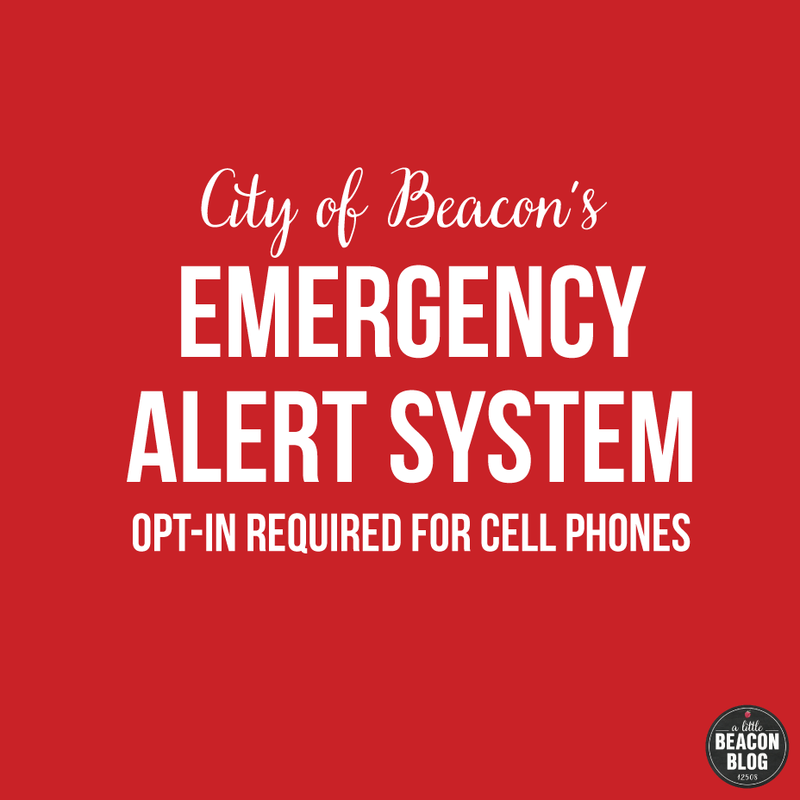 What can we expect this year from Beacon Open Studios? Because it's my first year directing, I really didn't want to make too many drastic changes. We ended up picking the second weekend of May for the date. That's the first thing, the fact that it will fall on Second Saturday this year. I thought it would only bring more visitors so it's a win-win. It happens to also fall on Mother's Day but again, I think the town will be hopping that whole weekend! We're also revising the color catalog. The more sponsors and registered artists we get, the bigger the budget we'll have to work with. We'd like to make a fold-out map this year so it's easier for visitors to find artist studios and figure out how to spend their day in Beacon. There will be musicians playing at certain venues and there are a few new locations to visit this year, including the Shambhala Yoga Center and the Creekside Lofts behind the Howland Cultural Center. Does this kind of event run in other cities? If so, where? Is it all connected? Or a general concept that gets picked up? There are open studio events all over the place. They're not connected in any way. It's a boost to any community to be considered a cultural destination. Not every town or city has a substantial community of artists like Beacon does. And even places that do, don't necessarily have open studio events. It takes a lot of dedication and hard work. BeaconArts and BOS is run completely by volunteers, and believe, me these people work hard!! 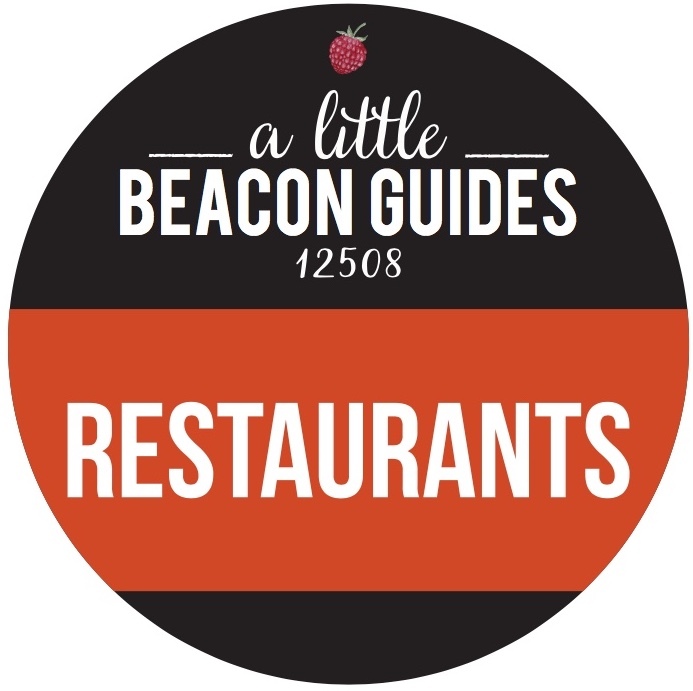 Beacon Open Studios is made possible with funds from the Decentralization Program, a re-grant program of the New York State Council on the Arts with the support of Governor Andrew Cuomo and the New York State Legislature and administered by Arts Mid-Hudson. 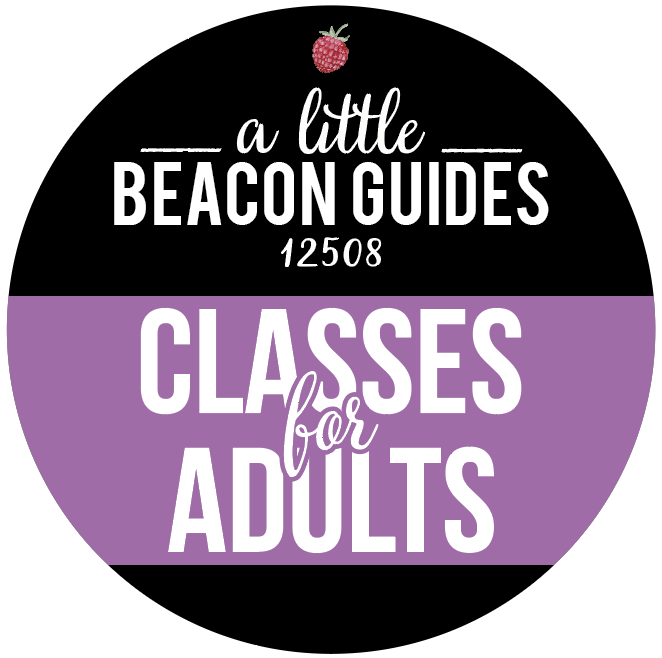 Beacon Open Studios is a sponsored project of BeaconArts, a 501(c)(3) organization supported through grants and donations and run entirely by volunteers. Chime in here with where you were able to visit, and tell us your favorite parts! A painting of the Woody Guthrie on a square canvas, similar to art produced for the "Little Boxes" fundraiser. The 38-year-old Woody Guthrie, a sailboat (aka daysail sloop) built by Pete and Toshi Seeger and the Beacon Sloop Club in 1978 to create public access to sailing on the Hudson River, will not be sailing this year. The Sloop Woody Guthrie instead will undergo a complete restoration, and is currently fundraising to complete those efforts. The most recent fundraiser is the "Little Boxes Art Contest" happening this Sunday, December 4, from 5 to 8 pm at Scenic Hudson's River Center (Red Barn) at Long Dock Park, Beacon NY. The Woody Guthrie is a long-standing symbol of river improvement: It was built to foster people's appreciation for the Hudson River during the early years of massive cleanup projects after General Electric (GE) had discharged 1.3 million pounds of PCBs into the Hudson River from two GE capacitor manufacturing plants located in the towns of Fort Edward and Hudson Falls, New York, between 1947 and 1977. The Seegers were instrumental in spearheading the cleanup and protection of the Hudson River. Building the Sloop Woody Guthrie was one way they demonstrated their commitment, and the sloop brought the public into direct contact with the Hudson to experience its vastness and river life for themselves. In 1969, Pete and Toshi Seeger and the Hudson River Sloop Restoration instituted the second great "Age of Sail" on the Hudson River with the launching of Clearwater, a wooden, gaff-rigged, topsail sloop, based on traditional designs developed over a 100-year period during the heyday of commercial sailing on the Hudson River. In order to make the boat more manageable by a modest budget and team of volunteers, the Woody Guthrie was designed as a smaller replica of the Clearwater. People are encouraged to participate in the contest as artists or as patrons bidding on the art, to be auctioned off on Sunday, December 4. For an entry fee of $25, (fee can be paid here) each artist will receive a 3 x 3-inch, numbered canvas on which to create an original work of art, in their media of choice, on the theme of "The Hudson River." This fee includes a ticket to the reception, which is otherwise $15 (ticket can be purchased here). Artists wishing to submit multiple entries may purchase an additional canvas for $5. All completed artwork must be returned by December 2. Registration as an artist, or to simply attend the event, which will include refreshments, can be purchased here online. To receive a canvas: Purchase your ticket online and bring proof of purchase to River Winds Gallery, 172 Main St., Beacon NY, Wednesday through Monday between noon and 6 pm. Tickets for the reception only are available for $15, and can be purchased here. 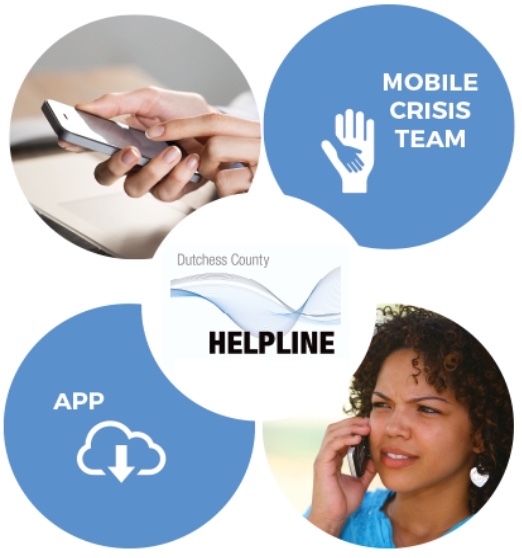 For more information, please contact Susan Berliner at 845-527-8671 or Rosemary Thomas at 845-463-4660.